TURIN -- Fiat plans to launch a compact sedan in China and Russia based on the Dodge Caliber replacement that launches in North America next January. The sedan will go into production in China in the second half of next year. Fiat has not yet announced timing for the Russia launch. Fiat will also launch a mid-sized sedan in China and in Russia in late 2013 based on the replacement for the Dodge Avenger that will debut in the United States the same year. Both sedans are based on a 40mm-widened version of Fiat's new Compact architecture, which Fiat and Chrysler call Compact Wide. The Compact architecture debuted first on the Alfa Romeo Giulietta compact hatchback last year. Fiat-Chrysler CEO Sergio Marchionne said the sedans are the first clear example of the global reach of the Fiat-Chrysler alliance, adding that the Compact Wide architecture will become "truly global" because it will also underpin future Jeep compact and mid-sized SUVs. He was speaking at Fiat's annual shareholders meeting on March 30. Fiat has not yet decided whether to sell the compact sedan in western Europe, where buyers prefer hatchbacks and station wagons over sedans. The mid-sized sedan could possibly come to Europe badged as a Lancia. Later this year, Lancia will start sales of its first rebadged Chrysler models -- the Thema large sedan, a rebadged Chrysler 300C, and the Grand Voyager minivan. Fiat will open a new China plant in July 2012 in the Changsha Economic Zone in Hunan province with joint venture partner Guangzhou Automobile Group Co. Guangzhou Auto has joint ventures with Honda Motor Co. and Toyota Motor Corp.
Fiat is also looking for sites and potential partners for a 300,000-capacity factory in Russia after a planned joint venture with Russia's Sollers collapsed in February when Sollers instead teamed up with Ford Motor Co. In Russia, in addition to the two sedans, Fiat also plans to build two Jeeps -- the Compass/Patriot and the Liberty/Cherokee successors. 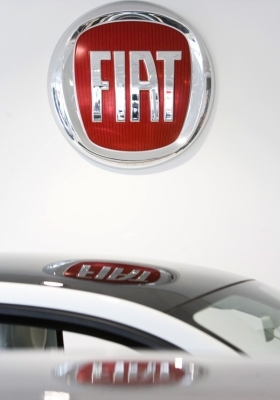 In China, Fiat will build the mid-sized sedan, as well the two Jeep models also planned for Russia. At full capacity, envisaged for 2014, Fiat-Chrysler plan to build a million vehicles a year underpinned by the Compact and Compact Wide architectures for the Alfa Romeo, Chrysler, Dodge, Fiat and Jeep brands.